Yesterday on the RWC Facebook Group wall Ria T. posted a question, basically wondering about her chances of success with some sort of sealed bucket system. Her hope was to completely avoid all possibility of dealing with fruit fly hassles. As fellow group members explained, using a sealed system definitely isn’t the best way to go. The worms and other composting critters/microbes need oxygen in order to do their job properly. My suggestion was to create some sort of breathable lid – using an old t-shirt (etc) or some sort of screen material secured with a large elastic band. This would allow enough air flow while still reducing the likelihood of fruit fly infestation. As you can see, the discussion inspired me to test out the concept by setting up my very own “breathable bucket bin”! and water spraying, to get past this stage more quickly? I felt it was important to address this one here on the blog since I very regularly mention using “aged horse manure” as a living material. With a system the size of a Worm Inn Mega, this can have the potential to create some heating issues – especially if a lot of food is being added as well. 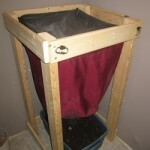 My name is Joshua and I have been playing with worm composting now for a year, have build a flow through system and am very much in love with what these little guys can do. Your site has been pivotal in my success thus far, so I turn to you with a perplexing question. While the belief that traditional composting is considered a “green” practice, and is without a doubt far superior to sending organic matter to the landfill, it does create a surprising amount of methane and GHG. It made me wonder if processing that same organic material with worms instead would retain the currently trapped carbon in the same way micro and macro nutrients pass through the worms undigested. Have you encountered any research or discussion of this being tested that you could share? Thank you for sharing your passion and have a wonderful night! You are right about traditional composting being known to release potent greenhouse gases, such as methane (CH3) and nitrous oxide (N2O). What’s interesting, though, is that vermicomposting actually came under scrutiny a number of years ago for having the potential to release a fair amount of N2O as well! Unfortunately the media kind of ran with it, publishing articles with headlines like “Worms are Killing the Planet” in various prominent newspapers, journals etc – and not too surprisingly, things got a bit out of hand.